Northumbria is one of the largest universities in the UK, based in the heart of Newcastle upon Tyne, students are attracted by our excellent academic reputation, our top 10 graduate employment record and our outstanding campus and sports facilities. Interested in studying at Northumbria? January 2019 admission is on-going. Come, start your journey with Northumbria University, and create your best future - what are you waiting for? 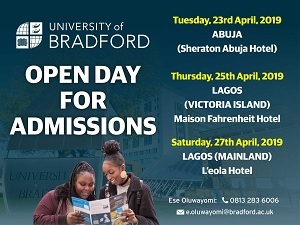 You stand a chance to receive Scholarships of up to £4,000 in tuiting fee. Off Ahmadu Bello Way, Victoria Island, Lagos.